As you’re browsing among lifestyle opportunities available through age 55 communities, you may think an adventure-filled, waterfront setting in conveniently located Central Florida is out of your price range. At Lake Griffin Harbor in Leesburg, we’re out to prove you wrong. Our gated community of well-maintained manufactured homes for active adults ages 55 and older sits next to beautiful Lake Griffin, a seven-mile aquatic gem that connects with other waterways to allow adventurous boaters to voyage all the way to the Atlantic Ocean. And even if you’re less ambitious, you can enjoy hours at Lake Griffin, which boasts some of the best largemouth bass fishing in Central Florida. What’s more, the wildlife- and bird-watching opportunities of this lakeside habitat are hard to find among affordable 55 communities. In addition, you’ll find Lake Griffin Harbor rivals many other age 55 communities for its proximity to tourist attractions that draw visitors from around the world. When you become a resident of Lake Griffin Harbor, those theme parks, beaches, sporting events, concert venues, and more will be only a short drive away. 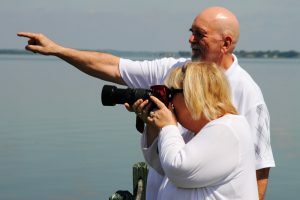 Let us show you one of the best Affordable Florida Lifestyles you can imagine in age 55 communities with a tour of Lake Griffin Harbor in Central Florida. Contact our Lifestyle Team today to get started.